Saturday saw us venture into Birmingham for the Love Wine Festival Birmingham 2017 at The Burlington Hotel. It was an adventure too as I still needed my wheelchair for distances and my crutches for short walking. I managed the wine tasting afternoon with just one crutch – priority was having a hand free for holding my glass – and standing on one leg to help keep the weight off my left ankle. It was not always easy but with the help of my Hubby and friends I made it and we had a great day. This was our first Love Wine Festival but it will not be our last – a fantastic day, great value too with tickets at £20. 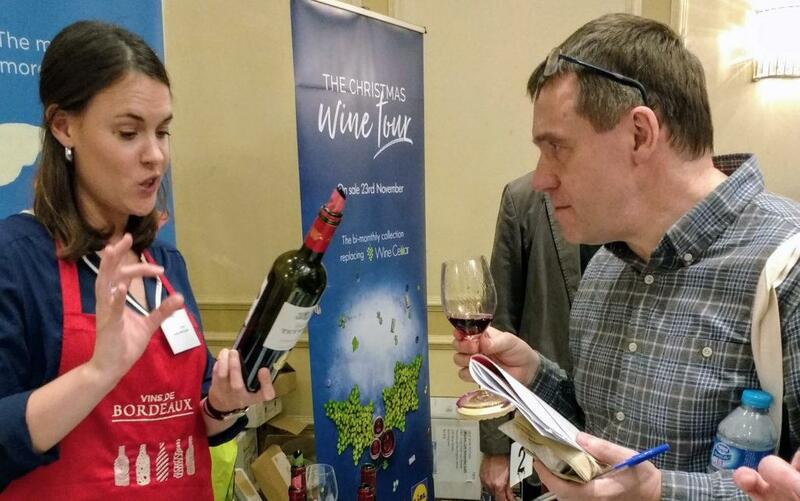 The venue was a large room in the hotel, great facilities, plenty of space and not over ticketed so many opportunities to stand and chat to the wine experts. Unfortunately my balancing skills are limited, one crutch and a wine glass was my limit, so no tasting notes or photos. Love Wine Festival have kindly allowed me to use their images and I’m hoping my memory will stand up to recalling a few of the many wines we tasted. I did however pick up quite a few really good leaflets and since the weekend I have enjoyed sitting on the sofa having a good read – with a cup of coffee but dreaming of wine. One of my favourite champagne houses, although to be honest we don’t have it very often especially rosé but their Pol Roger Brut Rosé champagne was delicious. Great bubbles, quite dry for a rosé which is probably why I enjoyed it. 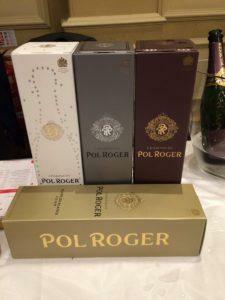 Their blanc de blanc was also superb – both a little pricey but for a very special occasion worth the extra. I was very impressed with another blanc de blanc I tasted, at The Champagne Collection. This was a beautiful crisp clear champagne – Cuchet Caz Blanc de Blancs. Joie de Vin was a great stand to visit, in fact I could have stood there longer as it was a haven of french wines. Beautiful Touraine Sauvignon Blanc, gorgeous Chenonceaux (my favourite Loire chateau) Blanc and a wonderful La Croix Boyd de Cantenac Margaux, a fine selection from my favourite country. A few Christmas’ ago our grown up children bought us membership of the Wine Society. We have enjoyed a few of their tasting events, visited their shop in France (unfortunately it’s now closed) and visited Domaine Jaume who produce their Cotes du Rhone. It was lovely to meet and chat with their team and of course taste some superb wines. I was very taken with their wine from Greece, my only previous Greek wine being on honeymoon over 28 years ago and a very cheap bottle of Retsina bought here in the UK. Thymiopoulos Naoussa Jeunes Vignes was a medium bodied red wine with slight tannins – a lovely surprise. I also enjoyed Chateau Vartely Feteasca Regala, a refreshing white from Moldova, and Faleos Nevados Torrontes from Argentina. There were so many new wines at this tasting, new both in their country of origin and/or the grape variety. It again highlights that our experience of wine is controlled by the wine available to purchase here in the UK or our adventures when holidaying abroad. I really appreciated the opportunity to try so many new wines and was particularly enjoyed with a wine from Georgia. The Georgian Wine Club had six wines, three reds and three whites. I was quite taken with Badagon Kakhetian Noble, a white wine made from Rkatsiteli the leading white grape variety grown in Georgia. I cannot tell you what the nose was like or the taste, not because I cannot remember but because it was like no other wine I have tried – really really good. 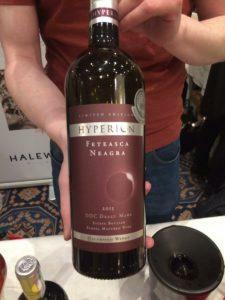 Another new wine for me to try was from Romania – Hyperion Fetesasca Neagra, a lovely smooth red. I have no idea if it is the same grape as the white wine from Moldova – I think I need to look into these wines a bit more. 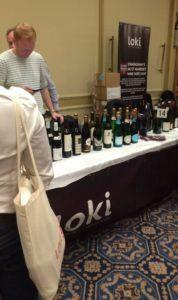 Loki is based in the centre of Birmingham so was geographically the nearest supplier to the tasting, and having a double stand was also one of the biggest. As well as a few of their white and red wines I also tried their three fortified wines: Sanderman LBV, Sanderman 10 year Tawny Port, both from Portugal, and Chambers Rosewood Ruthergien Muscat from Australia. All three were rich, smooth, just what you’d expect from a fortifies wine, a hard choice but I liked the Tawny Port best. 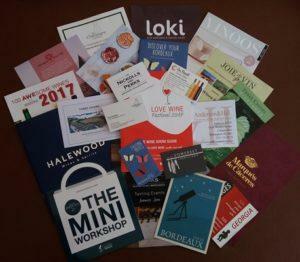 You can see in the photo the great ‘Love Wine’ tote bag we were all given as we entered the tasting room. Perfect for collecting all my brochures it also contained a very neat waiter’s friend, and a bubble wrap pouch to put our Riedel wine glass in for taking home – thank you Love Wine, it’s those little thoughtful extras that made the day extra special. 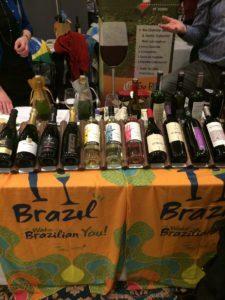 Brazil is another new wine country to me – we’ve had wine from other South America countries but I don’t think from Brazil. Their two bubbly sparkling wines, Campos de Cima Extra Brut and Amadeu Brut Rose (both made in the traditional method) were both delicious, I’d love a glass of these on a summer’s day in the garden. I enjoy malbec wine from Argentina and Chile so was keen to try the Sanjo Nubio Malbec from Brazil, and I’m so glad I did, it was unusually light for a malbec and so full of fruit, delicious. Cotswold Distillery and Langley Distillery/Palmers Gin had whisky and gin at their stands and ODC Drinks had fruit cider. Not something I usually drink as I find it quite sweet but ODC’s Pomegranate Panache was very drinkable, fruity, not overly sweet with a good finish; quite moreish too! Wine and food go so well together but which wine with which food. With so many new wines on show it came as no surprise to find new foods too – Eat Spain Drink Spain had some very tasty snacks including dried, roasted broad beans! Anderson and Hill are a delicatessen in the centre of Birmingham; they had a variety of cheeses. to taste. I love blue cheese and noticed a new name – Perl Las. It’s a Welsh blue cheese and so delicious we bought some home with us along with a Red Wine and Draycott Blue Salami from Somerset Charcuterie. Speaking of food, Mireille Reuling of The Real Wine Gum makes the most amazing sweets – as the name suggests ‘real wine gums’. As soon as these gems are in your mouth the wine flavour is there, the smooth sweets fill your mouth with delicious wine flavours – the chardonnay gum was my favourite – such a great concept, adult sweets at their best. So many superb wines, so tempting but impossible to buy all, however we did treat ourselves to a bottle of KWV Wine‘s Classic Collection Tawny from South Africa. I am looking forward to enjoying this as the winter night’s get longer. 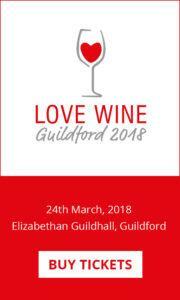 What a super day at The Burlington Hotel – Love Wine’s next tasting is in Guildford on 24th March 2018 – we’ll be there !! Article provided by Clare at Aimetu’s – wine, food and travel.